The Days of Johann, an agility dog! : Secretariat is great!!! 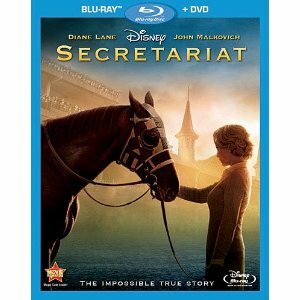 We are so lucky to get a copy of the newly released Disney DVD, Secretariat. The nice folks at Disney sent it to us free to review for all of you! Mum and I love horse movies, especially ones that involve competition and great stories overcoming obstacles. And this movie didn't disappoint! Although we knew about Secretariat and his great wins, and we knew the outcome of the story, we still enjoyed the journey and learning a lot about Peggy Chenery (Secretariat's owner) and all her family went through to bring Secretariat to the level he deserved. Secretariat was a racing machine! A cool tidbit of information...after his death at 19 years old, it was found that his heart was extremely large for a horse of his size. Estimated at 22 lbs, over three times the size of a normal horse, this abnormality is known as the x-factor in a small handful of successful racehorses and it is believed that this is why he was as good as he was. Cool huh? We found when we went to watch it in our DVD player that our player was on the fritz. So Mum got out our old Tohiba laptop that we replaced with our Netbook last year. She cleaned it up, dumped some old files, checked the toshiba laptops batteries, and voila! It's now our new portable DVD player, and we are loving it for watching movies, now and then! Anyways, we highly recommend his movie and are very glad to be able to see it thanks to the nice folks at Disney! Here's the official trailer, enjoy! Mom and dad really want to see that movie! Thank you for the review, Johann!